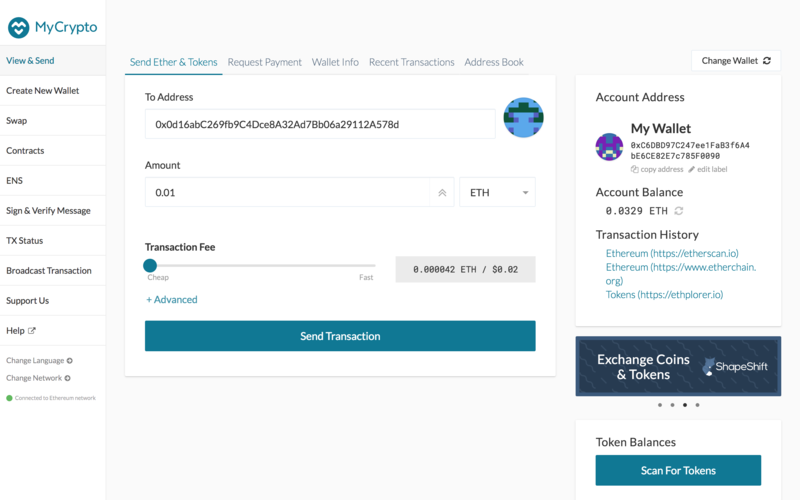 MyCrypto is an interface that lets you access the Ethereum blockchain. You can do things like creating and accessing Ethereum wallets, sending ether, requesting payment, deploying and interacting with smart contracts, and signing and verifying messages. The MyCrypto desktop app was officially launched in July 2018. Previously, it only had a web version. One of the key reasons MyCrypto launched a desktop app is to make it safer to use. Private keys, mnemonic phrases, and keystore files can no longer be used on the online interface. Overall, this new MyCrypto desktop app is intuitive to use and friendly for beginners. To get started, go to download.mycrypto.com and download the desktop app. Always check for the green “MyCrypto, Inc” SSL certificate on your browser address bar before downloading and do not continue if it is missing. Once you have downloaded and installed the app, the next step is to create a wallet that is suitable for you. 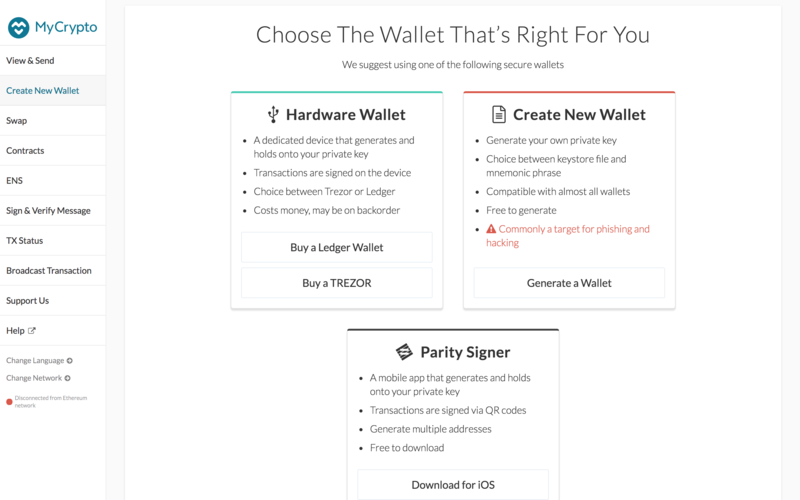 You may create a new wallet by generating your own private key, accessing it via your hardware wallet like Trezor or Ledger, or using the Parity Signer. Here we will choose to create a new wallet using our own private key. Click on the “Generate a Wallet” button and you will be presented with an option to generate either a keystore file or a mnemonic phrase. The main difference between a keystore file and a mnemonic phrase is that the keystore file provides a single address, while you can have multiple addresses with your mnemonic phrase. If you selected the keystore file option, save your private key and paper key immediately, and never share these with anyone else. 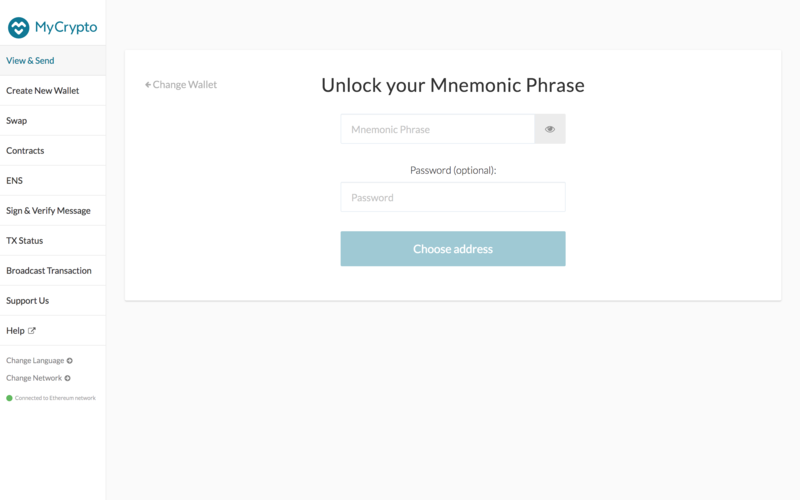 If you selected the mnemonic phrase option, go to the “View & Send” tab and key in your mnemonic phrase to unlock your wallet. This step can be done offline to increase security. Once you keyed in your mnemonic phrase, you will be presented with a list of ETH addresses to use. 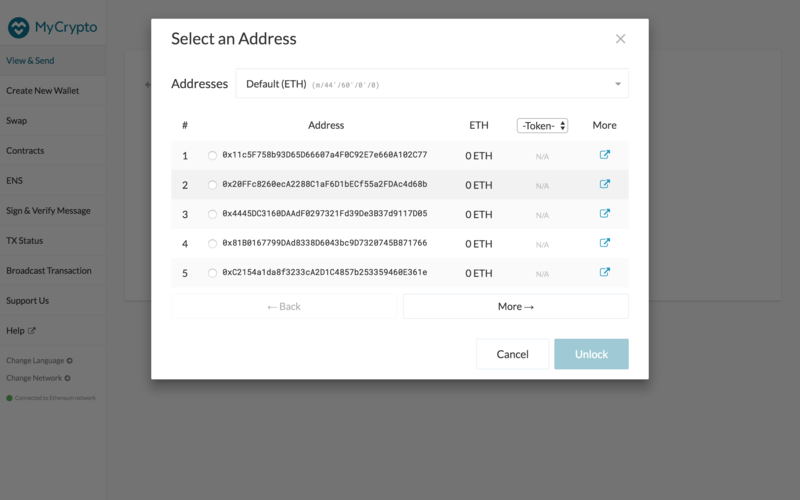 Select any address to unlock your wallet and you now have your new Ethereum wallet ready to be used! 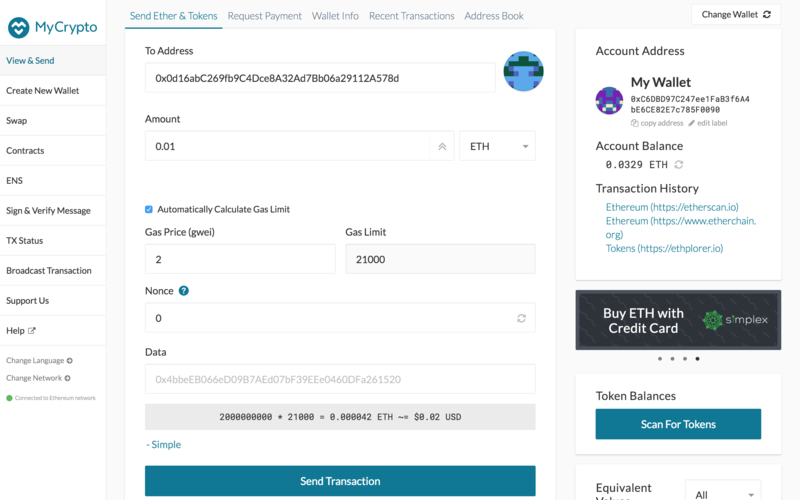 When sending ether, you will notice that there are two options for gas prices - simple and advanced. The total cost of a transaction is the the product of Gas Limit and Gas Price. You can think of gas as the fuel that is required to execute an operation or run a particular smart contract code on the Ethereum blockchain. In Ethereum, every transaction has a nonce. The nonce is the number of transactions sent from a given address. Each time you send a transaction, the nonce increases by 1. In order to save on the gas price, you can choose the cheapest option. I spent 2 gwei, which was recommended by the app. After sending it, you will see a confirmation popping up. You can then check on the transaction (TX) status. The transaction was successful within a few seconds. Gas price varies greatly and it increases significantly when the Ethereum network is congested. In Ethereum, signatures are a way of providing evidence that a specific user has access to a specific address. 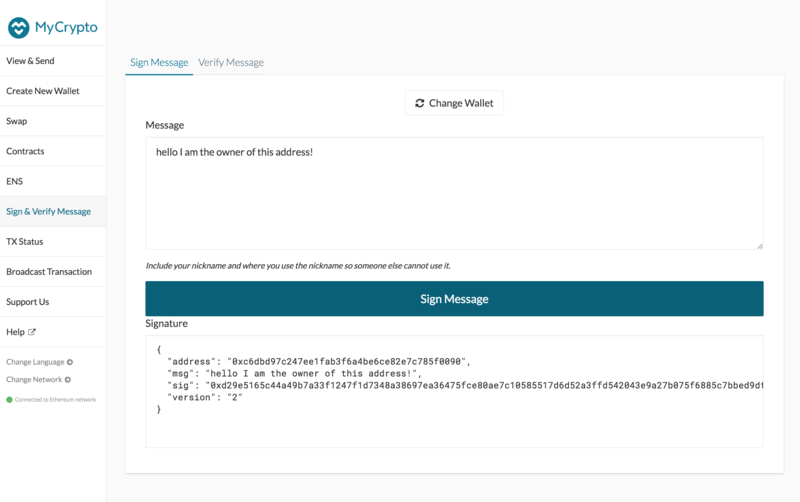 Write a message to prove that you own the address and click “Sign Message”. You can then share this message with anyone who you wish to provide evidence to that you own an address. 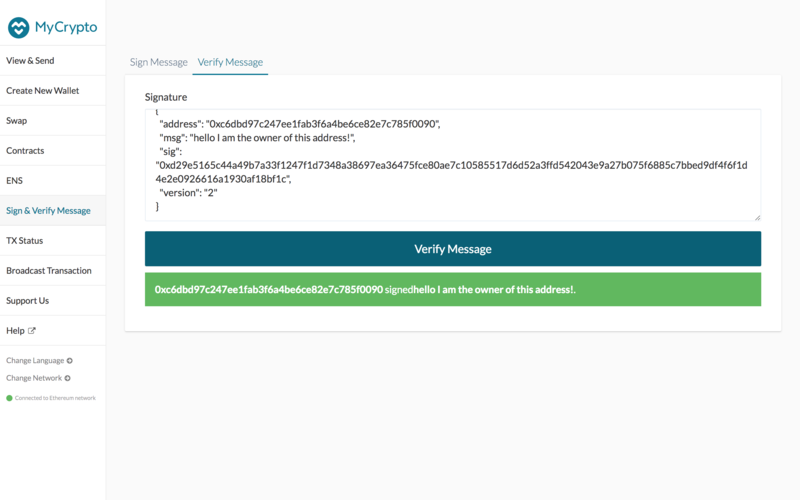 To verify a message, go to “Verify Message”. Copy and paste the message into the box and click the "Verify Message" box. 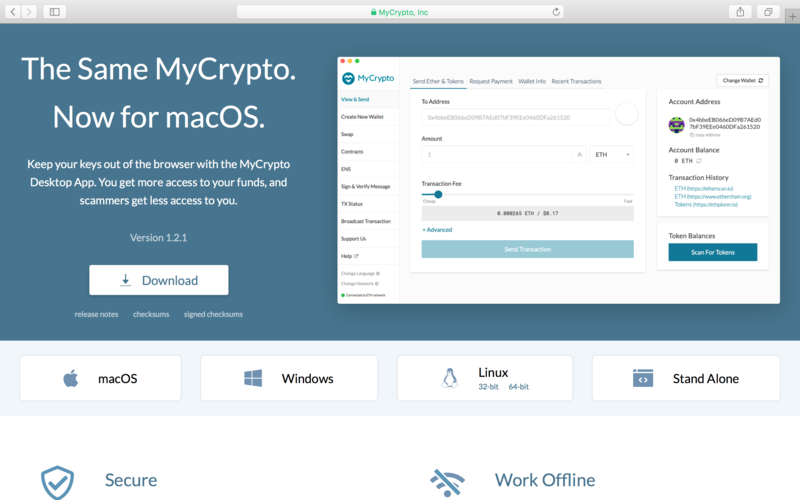 I hope that you find this guide helpful to get started using the MyCrypto desktop app! About Wang Yanhua — Wang Yanhua is a blockchain enthusiast and loves writing about all things crypto. She is currently a freelance writer for Coin Gecko and Block Asia.